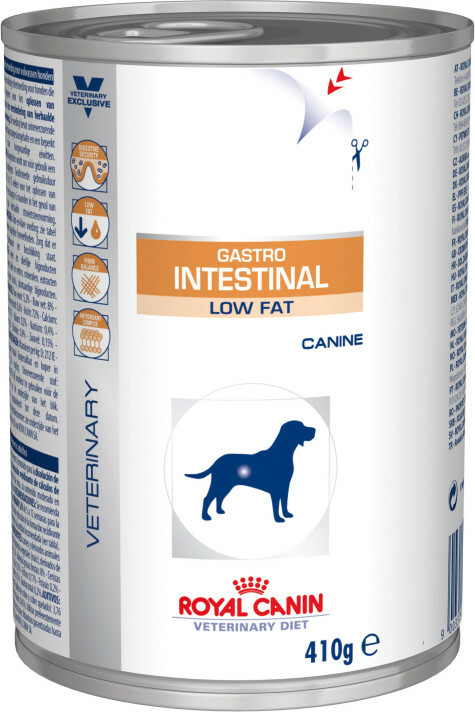 Gastro Intestinal Low Fat (can) For dogs with acute and chronic diarrhoea, hyperlipidaemia, acute and chronic pancreatitis, gastritis, oesphagitis, lymphangiectasia - exudative, enteropathy, Exocrine Pancreatic Insufficiency (EPI). 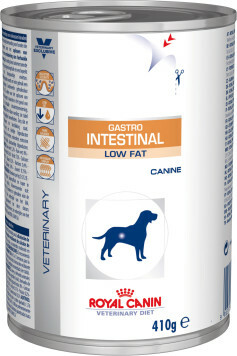 A combination of highly digestible proteins and starches, prebiotics, beet pulp, and fish oil helps support digestive health. Adjusted levels of soluble and insoluble fibre to help limit fermentation and promote optimal stool quality. 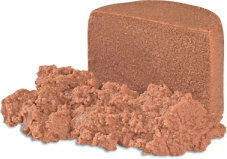 Pork liver, pork meats, corn, rice, minerals, cellulose, sugar beet pulp, taurine, yeast hydrolysate (source of Mannan-Oligo-Saccharides), fish oil, marigold meal (rich in lutein), trace elements (including chelated trace elements), vitamins. Crude ash: 1.5%. Crude fibre: 1.7%. Crude oil fats: 1.7%. Moisture: 74%. Protein: 7.5%. Vitamin D3: 200IU, E1 (Iron): 8mg, E2 (Iodine): 0.15mg, E4 (Copper): 1mg, E5 (Manganese): 2.5mg, E6 (Zinc): 24mg.